Shake up your summer with a cozy movie night under the stars! Venues across Rhode Island are offering free outdoor screenings of your favorite flicks all season long. And what’s better than a free good old fashioned good time? So, pack up your loved ones, snacks, blankets and chairs, and, most importantly: bug spray, and head to one of these fun movie nights at your local beach, field or park! Take a spin on the Looff Carousel at Crescent Park and then find a spot over on their grassy field for a movie night! This summer your can enjoy recent family hits like Disney’s Moana and Pete’s Dragon. Showings: Certain Fridays July through September at 8 p.m. July 28 – Boss Baby; Aug. 4 – Moana; Aug. 18 – The BFG; and Sept. 8 – Pete’s Dragon. Do you dare watch Jaws while sitting feet away from the ocean? Or do you want to get up and dance with the family while watching Happy Feet? Narraganset Town Beach is offering plenty of options for an enjoyable movie night in July and August! They will even have food trucks on site! Showings: Movies start at dusk. July 12 – The Secret Life of Pets; July 19 – The Lorax; July 26 – Casablanca; Aug. 2 – Happy Feet; Aug. 9 – Free Willy; and Aug. 16 – Jaws. This summer movie series is way more than your usual screening! 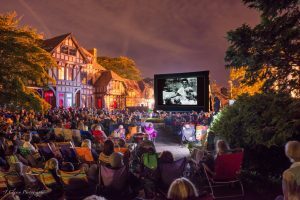 On certain Thursdays, join NewportFILM for award-winning docs, live music, on-site food vendors and Q&A sessions at Aquidneck Island’s most lovely outdoor spaces! Food vendors and live music will begin before the film starts, so you have time to claim your spot and snacks! Confirmed viewing locations this year: St. George’s School lawn, Kings Park, Newport Beach House: A Longwood Venue, The Elms, St. Michael’s Country Day School lawn and Ochre Court lawn at Salve Regina University. Showings: Please head to their website for more specifics. A $5 donation is suggested. The Rocks at Ballard Park will be showing both new and old hit films on Wednesdays in August at their oversized field! They recommend arriving 15 minutes before showtime to ensure a good spot. Showings: Wednesdays in August at dusk. Aug. 2 – Finding Dory; Aug. 9 – Beetlejuice; Aug. 16 – The Birds; and Aug. 23 – Star Wars Rogue One. From the new box office smash Sing to the beloved classic success ET, go to the Boathouse Lawn for surefire fun! You can even grab a bite from one of the one-site food trucks! Showtimes: Movies start at sunset. July 14 – Sing; July 28 – The Secret Life of Pets; August 11 – A League of Their Own; and August 25 – E.T. The Extra-Terrestrial. Visit Providence’s only outdoor theater for a relaxed night at Grant’s Block downtown! The best part is that you’re near countless local shops and restaurants for pre and post movie fun! Showings: Thursdays at sunset through August 31. At these family-friendly movie nights you get two for one views: the film and Narragansett Bay! Food trucks will be on-site serving: shaved ice, coffee, grilled-cheese sandwiches and more! Showings: Movies start at dusk on Thursdays. July 13 – Zootopia; and July 27 – Moana. Stay tuned on their website for more! “Big Screen Movies on Misquamicut Beach” begins Tuesday, July 11 and goes through August 22, 2017. Bring your beach chairs and blankets to Misquamicut Beach and watch free family – friendly flicks beginning at 8:30pm! You can catch the Disney classic Lilo and Stich while sitting on a beach! Showings: July 11 – August 22 every Tuesday night at 8:30 p.m. July 11 – Finding Dory; July 18 – The Land Before Time; July 25 – Daddy Day Care; Aug. 1 – Charlie and the Chocolate Factory; Aug. 8 – Cars; Aug. 15 – Lilo and Stitch; Aug. 22 – Secret Life of Pets. Have you attended one of these free summer movie series or do you know of another? Tell us in the comments below! For extra fun, check out these movies that were filmed in Rhode Island! Next Meet Polo…Our Adoptable Pet of the Week!